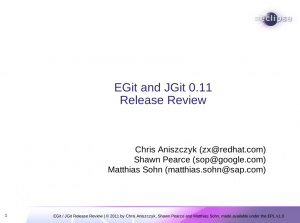 The EGit and JGit teams are happy to announce the 0.11 release, just in time for Helios SR2! I’m happy to say we accomplished a lot for the 0.11 release which was mainly meant for improving some usability and performance issues (and of course, catching the Helios SR2 date). In JGit (new and noteworthy), additions were made to the porcelain API along with git-notes support. In EGit (new and noteworthy), we focused a lot on improving the performance so people should see improvements from the decoration of resources to the synchronize view. 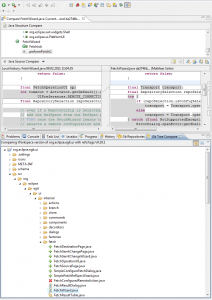 In terms of features, EGit now supports Mylyn integration via the commit dialog and history view. We also now support comparison of trees so you can easily compare projects and folders with the Compare with… action. If you’re interested in helping us get to 1.0, please try out the code, file bugs and contribute if you have time. If you like what we do, consider starring EGit on the Eclipse Marketplace. We plan to iterate quickly so the next EGit and JGit release is planned for late April with a 1.0 for the Eclipse Indigo release in June.